"The captivating Sunday Times and New York Times number one bestseller by the Orange Prize-winning author of The Song of Achilles; `spellbinding ... a thrilling tour de force of the imagination' (Mail on Sunday) `Fabulous' Daily Telegraph `Blisteringly modern' The Times `Bold and sensuously written' Daily Mail `An airy delight' Observer God. Mortal. Daughter. Monster. Saviour. Outcast. Lover. Destroyer. Creator. Mother. Witch. Scorned, rejected and at last exiled from her father's house for her dark gifts, Circe arrives on the remote island of Aiaia with nothing but her wits and magic to help her. But there is danger for a solitary woman in the world, and Circe's independence and strange powers draw the wrath of men and gods alike. To protect what she holds dear, Circe must decide whether she belongs with the deities she is born from, or the mortals she has come to love. 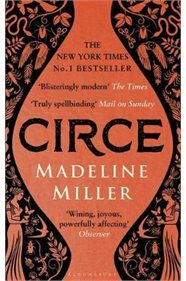 Complicated and wounded, gifted and passionate, Madeline Miller's captivating Circe steps out of myth and into the present as a heroine for our time, and all times."